Nominated for Best Documentary 2006 of the European Film Academy, Winner of Dok Leipzig for Best Documentary, Winner of Shanghai IFF for Best Asian Documentary, Winner of One World Human Rights Documentary FF for Best Director, Winner of DocAviv 2006. 10 o’clock, Saturday morning. A group of elderly women and men carry plastic lawn chairs across the Mount Herzl National Cemetery in Jerusalem. In the shade of an old pine tree, they sit down, in a circle and discuss matters sublime and elevated. For over two decades, the "Mt. Herzl Academy” has held its weekly meeting at this cemetery. Seated between the graves of the nation's dignitaries, they debate the history of modern philosophy, read poetry, eat lunch and determine the fate of the Jewish nation. Director Tali Shemesh has been following the "Academy" for the last 5 years, focusing on two members: Minia, the director's grandmother, and Lena, her great aunt. The film unravels the jagged, intense, almost impossible relationship between these two extremely different women, who – each bereaved of the man she loved – remain bound together by history and fate. As death decimates the group that has given meaning to their lives, the film explores the conflicts between Lena and Minia, and the family secrets that haunt them. The result is a poignant, intimate, sometimes hilarious portrait of the Holocaust generation like you’ve never seen it before. "Celebration of life. Sensitive, clever, funny, and above all – compassionate. Excellent". 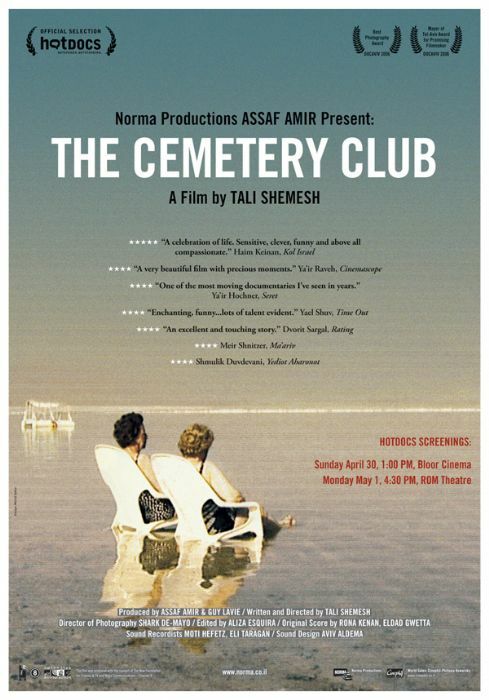 "The Cemetery Club is one of the most powerful and multi-layered documentaries I have seen in recent months. It has elements of tragedy and comedy, of rich fiction and poignant political satire. I enjoyed the fine artistic logic that Tali Shemesh employs to highlight the relationship between the two women on the background of their advancing age, their loneliness, and their mutual thirst for human contact. It is a magnificent film."